Do you wish your son or daughter would tell you more about what is happening in their life, and that they would open up to you more often? Are you worried about them as they seem to be spending more and more time in their bedroom and on their smart phone? The teenage years can be a time of concern and worry for parents and carers from all backgrounds. However, Why Won’t My Teenager Talk to Me? 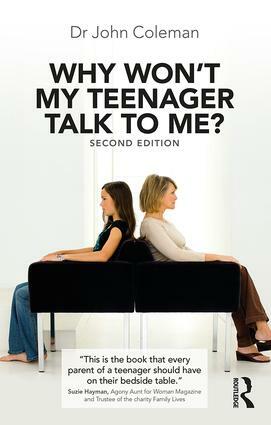 offers the parent and care-giver insightful and practical advice, as to how to encourage positive and respectful two-way communication between you and your teenager. The new edition of this essential book offers a positive way of thinking about the teenage years. So much has changed in the last five years since the book first appeared. Our knowledge of the human brain has increased, and this new edition includes a whole chapter devoted to the changing teenage brain. The social world of the teenager has also continued to change. Alongside the voices of a wide range of parents and carers of teenagers, Dr John Coleman explores this changing social landscape, addressing issues like social media, mental health, and gender. Communication is really at the heart of Dr John Coleman’s message – talking and listening are essential – and this book offers up new and valuable ways in which communication can help the parent and care-giver manage family life during the adolescent stage of life. It will also be useful to professionals working with young people in the fields of social work, counselling, health, and education.